Originally founded by Kōbō Daishi during the early 9th century, Danjo Garan contains several buildings–including the Konpon Daito, or pagoda, that Kōbō Daishi himself had a hand in constructing. 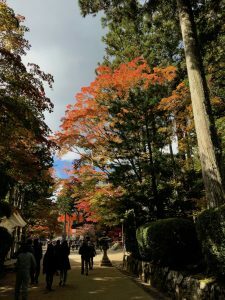 Danjo Garan is also famous for its spectacular maple trees, which put on intense shows of beautiful foliage during the autumn months. 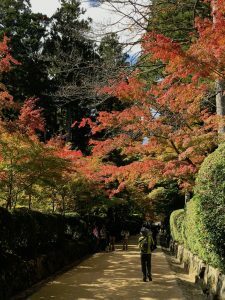 In fact, the path from the main street area to Danjo Garan is lined with maples, and draws large numbers of people during momijigari (leaf hunting/leaf viewing) season. Although Danjo Garan has over twenty temples and other buildings, including the towering Konpon Daito, the maple trees hide visitors’ views of the complex until the final moments before arrival. The first time I visited, I walked down the tree-lined path with anticipation, marveling at the spectacular colors and vibrance of the foliage (and dodging dozens of camera-toting leaf-hunters along the way). The autumn air was fresh and sweet with the smell of freshly baked taiyaki–crisp pancake-style cakes shaped like fish and filled with custard cream or adzuki beans. As I reached the end of the path, the spire and roof of the Konpon Daito appeared through the trees (at left, in the photo below), as did with the roofs of several other temple buildings. 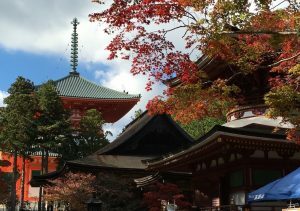 I emerged from the trees into a large, open area dotted with temples and halls – the famed Danjo Garan. The site contains far too many interesting places to include in a single post, so we’ll continue the journey with a virtual walk to the Fudō-do, a 12th century hall that enshrines a statute of one of Shingon Buddhism’s most important deities. 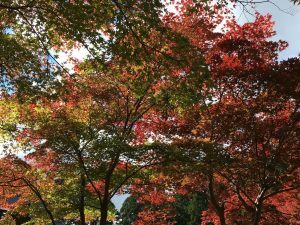 Do you like autumn leaves? What’s your favorite place to see them? ← A Visit to Koyasan, part 1: Up the Mountain!